There are many downloaded YouTube videos on my computer and most of them are formatted with MP4 (H.264), FLV, AVI, MOV, etc. I want to convert YouTube to HEVC for replaying on my iOS 11 iPhone X. Is there any proper YouTube to HEVC video converter for recommendation? As is known to all, though HEVC offers higher compression ration than H.264, it has not been adapted universally like H.264. YouTube doesn't support uploading video files encoded with HEVC/H.265 and they still don't have any plans to support it, at least for the time being. That is to say, you can't get HEVC videos from YouTube directly. Commonly, your downloaded video from YouTube is formatted with MP4, FLV, AVI, MOV, 3GPP, MPEG4, WMV, MPEGPS or WebM. These YouTube supported format videos perhaps are bigger size or blurry. Thus, how to make downloaded YouTube video size smaller and improve video quality at the same time? Simply, you can convert YouTube MP4, FLV, AVI, MOV, etc to HEVC/H.265 to be compatible with HEVC-capable devices like iPhone/iPad/Android, mac OS High Sierra Macbook/iMac and Win 10 computer. * convert any YouTube video encoded with all sorts of video codecs to HEVC/H.265 with smaller size and original quality reserved, for example, H.264 to HEVC, DivX to H.265, WMV to HEVC, VP9 to HEVC, FLV to HEVC, etc. * convert YouTube to H.265/HEVC at superfast conversion speed due to the application of multi-core CPU utility, hyper-threading, and Intel Quick Sync Video hardware acceleration techs. * transcode YouTube to HEVC/H.265 from 360p to 720p, 720p HD to 4K, or 1080p to 4K for HD/4K playback. * directly decode any YouTube video to HEVC-capable mobile devices including iPhone X/8/7/6s/6/SE, iPad Pro/Air/Mini, Samsung Galaxy Note 8, Huawei P9, Xiaomi Mi 5, etc. * free download any videos from YouTube, Vevo, Vimeo, Dailymotion and other 300+ sites. download Windows version if you are a Windows user. Step 1: Open up this fast HEVC video converter on your Mac/Win and click "+ Video" button to input YouTube video you want to convert. BTW, you are allowed to add more than one videos at a time. Step 2: Choose HEVC MP4 or HEVC MKV as output video format. 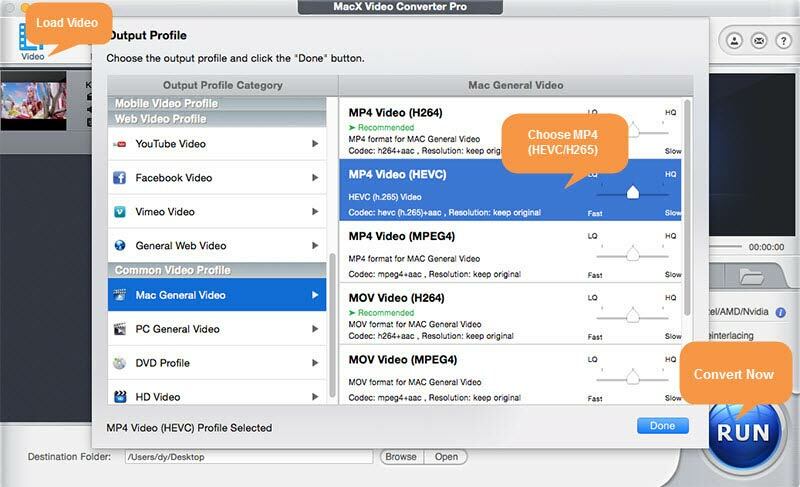 To play HEVC on iPhone iPad Android mobile devices, you should go to "Mac General Video" category to select HEVC MP4 as the output format in order to avoid incompatible issue. To upconvert 360p, 720p/1080p YouTube video to 4K UHD HEVC/H.265, please go back to the main interface of this YouTube to HEVC/H.265 converter and tap settings icon to adjust the video resolution to 4K 2160p. To edit YouTube video, please click "Edit" icon to personalize the output video by adding subtitle/watermark, cutting off unwanted part, rotating video, etc. Step 3: Specify an output folder to save the converted YouTube videos and hit "RUN" button to start converting YouTube to HEVC/H.265 with no quality loss. Later, you can stream HEVC video on various devcies or HEVC players (5KPlayer, Potplayer, VLC media Player, etc). HEVC/H.265 (High Efficiency Video Coding), the successor of AVC (H.264 or MPEG-4 Part 10), features of high compression ratio and improved video quality. HEVC doubles the compression efficiency comparing with H.264 (H.265 VS H.264). It supports 4K and even 8K UHD. The common HEVC-capable portable devices include: iPhone X/8/7/6S/6/SE/5S, all iPad Pro models, iPad (2017 model), iPad Air /2, iPad Mini 4/3/2, iPod touch (6th generation), Samsung Galaxy Note 8/S7/S7 Plus and newer, Google Pixel/Pixel XL and newer, Huawei P9 and newer, Sony Xperia® X and newer, Xiaomi Mi 5 and newer, LG G5 and newer, HTC U10 and newer, Moto Z® and newer, OnePlus® 3 and newer. Free download best YouTube to HEVC/H.265 converter - MacX Video Converter Pro to easily and fast convert 360P or 720P/1080P HD YouTube video to 4K UHD HEVC/H.265, MP4, AVI, MOV, H.264 etc for free playback on HEVC-capable devices and players like iPhone, iPad, Android, VLC player and more.